This is the story of Tim Fischer's journey, from a country town in far southwest NSW to the centre of political power. It tells of an individual quietly determined to push past barriers and who succeeded where very few expected him to; of someone prepared to be different and to make that difference part of a distinctive personal style. Here too is the very personal story of a man who came to acknowledge the conflict between the demands of a high-profile public life and the needs of a family life, and made the toughest political decision of his career - to step down as Deputy Prime Minister of Australia. 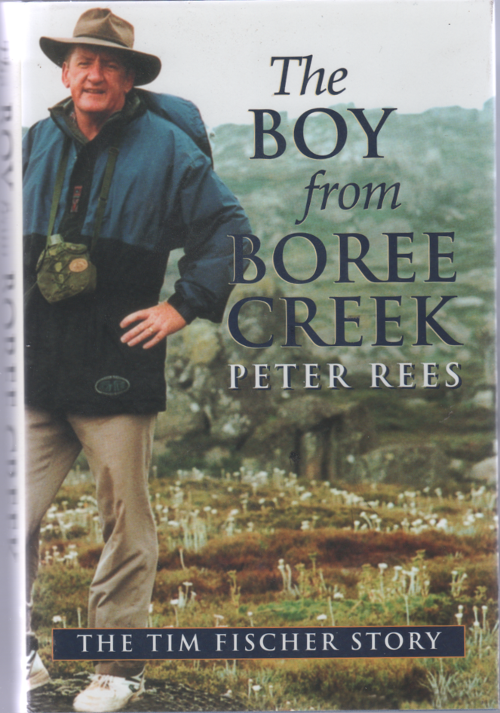 In doing justice to a remarkable and often surprising public life, The Boy from Boree Creek not only tells the story of the making of that rare thing, a much respected, indeed much loved, politician, it also provides a revealing look at how politics is played today. From the first page - THE BIG man seemed a little more stooped than usual, as if struggling with a burden he knew he must cast off. There was no hat this time to cover the thinning hair, nor a long bush stick on which to lean. One look at the eyes in that time-worn face confirmed the gravity of his mood. The background chatter faded and a sense of melancholy settled on the House of Representatives as Tim Fischer rose from the leather ministerial bench. The time was 3.19 p.m. on 30 June 1999, the last federal parliamentary sitting day before the winter recess. Timothy Andrew Fischer AC FTSE (born 3 May 1946), is a former Australian politician. Fischer was born in Lockhart, in the Riverina district of New South Wales, son of a farmer of German descent. He was educated at Xavier College, Melbourne. In 1966 he was conscripted into the Australian Army, and served in the Vietnam War - an experience which left him with a lifelong identification with the Australian armed forces, as well as an affinity with Asia. On his return from Vietnam, Fischer took up farming at Boree Creek in the Riverina, and became active in the Country Party, as the party was then called. He represented Sturt in the New South Wales Legislative Assembly from 1971 to 1980 and Murray from 1980 to 1984. For most of that time he was a fairly unremarkable country member (although he served on the opposition frontbench from 1978 to 1984), which makes his rapid success in federal politics all the more surprising. In 1984 Fischer won the federal seat of Farrer for the National Party of Australia (NPA), as the Country Party had been renamed. Within a year he was on the opposition frontbench, and soon became a popular figure in both the NPA and the Parliament: his sometimes rustic manner and bumbling English concealing a shrewd political brain. In 1990, when the attempt by Charles Blunt to modernise the NPA's image ended with his losing his seat, Fischer was elected NPA leader, defeating the former leader Ian Sinclair. Fischer was an enthusiastic supporter of the "Fightback" package of economic and tax reforms proposed by the Liberal leader Dr John Hewson in 1991. But he was unsuccessful in persuading the majority of rural voters, particularly in Queensland, that the proposed changes, particularly the goods and services tax (GST) was in their interests, and Labor under Paul Keating won the 1993 election. The Liberals finally regained office under John Howard in 1996. Fischer became Deputy Prime Minister and Minister for Trade, although the NPA was in a much weaker position in terms of seats than it had been in previous coalition governments under Robert Menzies and Malcolm Fraser. Fischer supported the government introducing tough gun control measures following the Port Arthur massacre in April 1996, measures which were opposed by many rural people. Fischer also had difficulty with the determination of many Liberals, including the Treasurer, Peter Costello, to carry out sweeping free-market reforms, including abolishing tariff protection for rural industries, deregulating petrol prices and other measures seen as harmful by farmers' organisations. The issue of native title for indigenous Australians following the Mabo and Wik decisions also caused much political difficulty for Fischer. Further trouble for Fischer and the NPA came with the rise of One Nation, a right-wing populist party led by Pauline Hanson, a disendorsed Liberal candidate who was nonetheless elected member for the Queensland seat Oxley at the 1996 federal election. One Nation had its greatest appeal in country areas of New South Wales and Queensland, and during 1997 and 1998 it looked as though One Nation might sweep the NPA out of existence. In the 1998 election campaign, however, Fischer strongly counter-attacked One Nation, mainly on the grounds of their "flat tax" economic policies, and succeeded in holding the NPA's losses to one Senate seat in Queensland. In 1999 Fischer surprised his colleagues by resigning as party leader and as a minister, and by announcing that he would retire at the election due in 2001. His decision to quit politics was motivated partly by the demands of his family. In 1992 he married Judy Brewer, and they had two sons, one of whom (Harrison) suffers from autism. Since his retirement he has returned to farming at Boree Creek, and is involved in charity work, assisting organisations such as the St Vincent de Paul Society, The Fred Hollows Foundation and Autism New South Wales. In 2004, Fisher was appointed chairman of Tourism Australia. His term as chairman ended on June 30th, 2007. In 2005 Fischer received Australia's highest civilian honour, when he was made a Companion of the Order of Australia (AC). Fischer is noted as a tireless advocate for rail transport and is probably Australia's best known railfan. He had a childhood hobby of studying rail gauges of the world. Since retiring from politics he has continued his association with rail as Special Envoy to the Adelaide to Darwin railway line and travelled on the first freight train and first Ghan passenger train to Darwin in 2004.